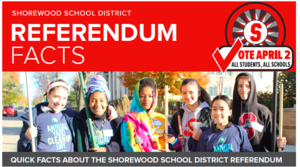 The Shorewood School District will have two referendum questions on the April 2, 2019 ballot to address immediate and ongoing critical needs on each of Shorewood’s school campuses. The Board of Education developed the proposed plan over the past several years with extensive community and staff input. Click here to view Key Facts about the Facilities Referendum. Also see: Project Scope and Floor Plans. The District will be hosting upcoming informational sessions at each of the four schools for families and community members to learn more about the proposed plans for each school. March 11: Atwater Elementary School, Library, 6:30-8:00 p.m.
March 13: Shorewood High School, Library, 6:00-8:00 p.m.
March 13: Shorewood Intermediate School, Commons, 6:00-8:00 p.m.
March 18: Lake Bluff Elementary School, Library, 9:30-11:00 a.m.
We look forward to seeing you at the sessions.